Anyway... Elwing, from Shining Tears. Extreme usage of Shinta's tree and leaves brushes. I like the leafy effect ^^ . There is perhaps just a bit too much of it there, but me likes anyway. Nice work. i would have to agree that there is a cluttered feel about it around the character at least since when its all leaves it just serves as a really nice pattern, but other than that i really like this piece. thanks for posting it. Nice wall!!! She is a lovely elf!!! The background is very good!!! You did a amazing wall!! Wow. You really did a beautiful job creating the forest, looks like she camouflaged or something. And you even did the shading of the branches on her legs and the rest of her body. Very nice job. Is that deedlit?! @_@; regardless, it's a spiffy wall, i really dig it! whoa, not really any mistakes, x_x its that good. Really, how did you get it to be this way?? I love the leaves and vegetation!!! It looks so great!!! The shading looks really nice and I love the style, keep it up!! My lucky day! I was looking for a nice dark wallpaper today and here it is. The mood is perfect. Very nicely done.... I can't get over those wonderful eyes. This is a very nice wall you've made here. 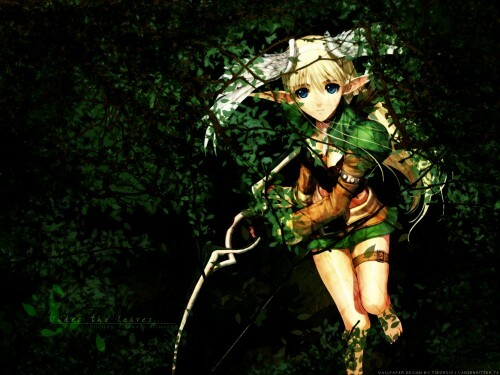 I like your overall idea of layout with cute elf character holding her weapon beneath forest leaves. My only issue is I wish you ease up on the amount of leaves you did on the wall. Also, some of the leaves could use some work to make it more realistic. You can see through on some of the leaves. My goodness. I must say that I see absolutely nothing wrong with this wallpaper of yours. Simply gorgeous and very appealing. The leaves, and tree branches are very nice and the stock image quality is superb. You also did a fabulous job with bringing her bright blue eyes out. Gorgeous. I'd like to keep an eye on your stuff ;). So if you wouldn't mind I'd like to add you to my friendlist. Have a nice day ^_^. Hmm... from afar I thought she was Deedlit! I guess not... aww, LOVES! Really nice paper. 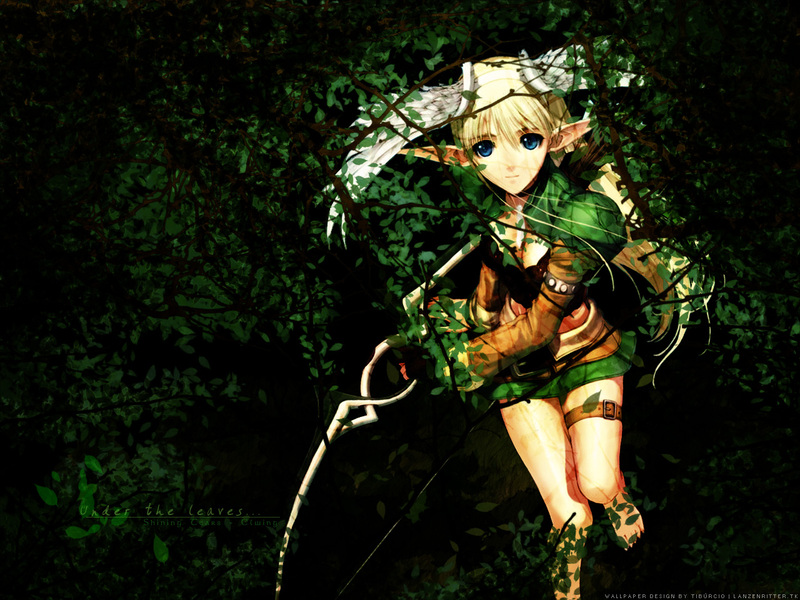 I really like the leaves and the way you managed to make it look like she is sitting in the middle of a dense forest. Very cool. Great wallpaper. Thanks for sharing. well done! this one is terrific! No one in here! could choose a better place for this girl! Great! great! great!